Being authentic is something many of us strive for: to be true to ourselves at all times and in all arenas of our life. And to be the same person no matter the situation or environment. But while this may be the goal, it doesn’t always feel possible. And our careers are an area that can be particularly tricky to navigate. In fact, in a study by Deloitte, 61% of respondents reported “covering” at least one dimension of themselves at work. What’s covering? It’s a term used to describe how people with a perceived stigmatized identity make a strong effort to minimize this part of themselves. In other words, covering relates to hiding a part of ourselves for fear of what people might think. Appearance-based. The covering example given is a Black woman straightening her hair to de-emphasize her race. Affiliation-based. An example of covering may be a woman avoiding talking about being a mother because she doesn’t want her colleagues to think she’s less committed to her work. Advocacy-based. The study shares an example of a veteran refraining from challenging a joke about the military, concerned he may be seen as too harsh. Do any of these examples resonate with you? Have you found yourself covering in the past? And are there other aspects of yourself you tend to shy away from sharing? I can definitely relate. In the past, I worked on teams that would decorate the office for the holidays. But then a role change put me on a more formal team where that type of thing wasn’t done. Despite being a festive person and loving the ritual of decorating with my colleagues, I was worried I’d be seen as too flighty or immature. The atmosphere was a bit of an old boy’s club, and the last thing I needed was to be seen as young, ditzy, or out of touch. This was an example of age and gender affiliation-based covering. Covering is something many of us face. With this in mind, here are some ways to stay true to yourself in the workplace. Looking at the definition of covering, a lot of it is based on the fear of what others may think. We cover because we’re afraid of being judged and thought of in a negative light. But it’s important to recognize what happens when we aren’t authentic. With inauthenticity comes a price, and it can impact us both inside and beyond the workplace. When we’re not true to ourselves, we’re often uncomfortable, unconfident, and ultimately not bringing our best selves and brightest ideas to the table. We’re making ourselves smaller, playing it safe, and holding back. The reality is that when you’re uncomfortable or lack confidence, people can see and sense it. But when it comes to our careers, aren’t those the very things we are looking to avoid? Don’t we want to be comfortable, confident, and vibrant? Aren’t we hoping to show courage and smarts? And don’t we want to have the power to influence people and outcomes? If that wasn’t bad enough, not being authentic at work carries over to our personal lives. Being someone else or masking parts of yourself is DRAINING. And acting in a way that’s out of alignment from your true self (and often your core values) can lead to a lot of unsettlement and anxiety. These things have the habit of trickling over into your hours away from work, leading to greater irritability and a more stressful life. With the benefits of authenticity in mind, it can be tempting to want to share every aspect yourself at work. This isn’t always the best idea. Why? There are other factors at play like the team culture, norms, and structure. With my holiday decorating example, while it would have been authentic for me to decorate my desk, it went against the culture of the team. More than that, it probably would have been seen as disrespectful by some given the formal environment. And while it would have been a fun activity, the small joy was greatly outweighed by the likelihood it would be seen as unprofessional. Reflect on what types of things matter most to you and lean in there. Are you a proud mother who doesn’t want to hide that part of herself? A spiritual person who doesn’t want to cover the fact that their upcoming vacation is to a meditation retreat? Look at what’s important to you, central to your being, and worth bringing into your professional persona. We’ve talked about being authentic to ourselves and our identity, but what about being authentic to our beliefs? True authenticity at work involves speaking up when we believe something is wrong, sharing our ideas, and saying what we think. Sometimes it involves taking the hard road or voicing an unpopular belief. But it’s always about being true to our values. You’ve probably heard of the recent outrage surrounding an H&M ad that was racially insensitive. Think about how many people would have seen the picture or ad at various stages before it hit the media. Dozens! I would expect that at least a handful of them disagreed with it. But they didn’t speak up. In that case, authenticity would have been acting in line with their beliefs and questioning the image. 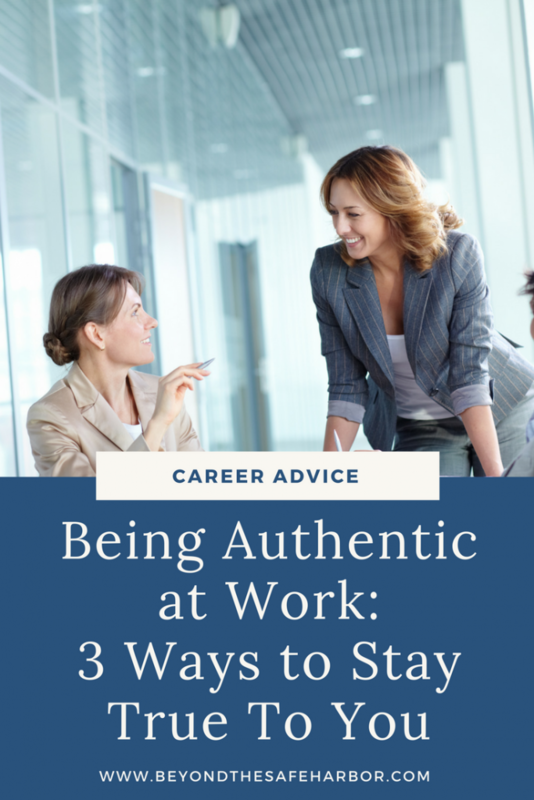 Leave us a comment: how do you say authentic at work? Where have you struggled in the past at being true to yourself? And how do you navigate the line between authenticity and unprofessionalism?